Directions: Naples beach roads are all toll spots so bring plenty of quarters. There are a number of lots nearby, but the cost is the same, so if you want to get as close to the spot as possible, park on 3rd Ave South and feed the meter. 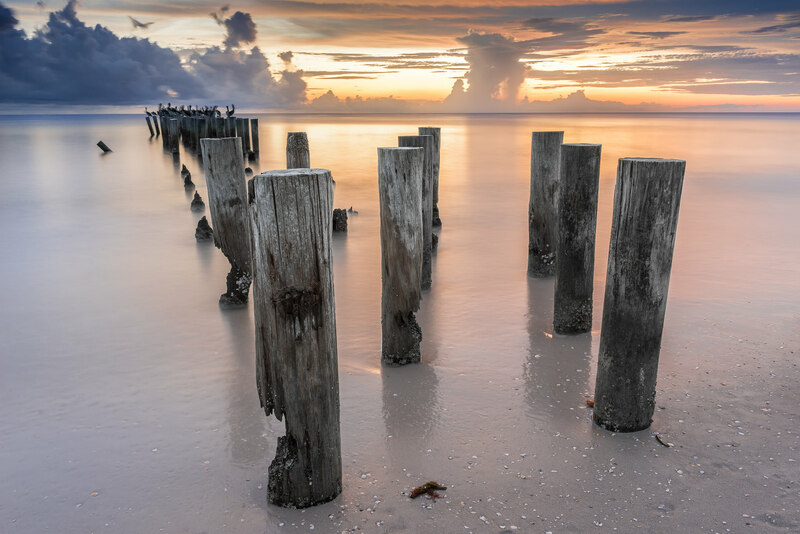 There’s not much left of the Old Naples Pier, just a few rows of pilings which serve as a place for the birds to rest while feeding. Still, they make for a great foreground element. Naples beaches are very popular, and the sunsets always bring out a crowd so take this into consideration. You might have to visit more than once but it’s a great place to vacation so repeat visits shouldn’t be an issue! The gulf coast has some spectacular sunsets, but sunrise might work as well. Just be sure you’ve got some clouds in the sky. Bring your tripod, as well as an assortment of filters. GND will definitely help here, as the pilings don’t rise much above the horizon so you shouldn’t have any weird blending issues with the GND. hi Eddie, could you specify the usual parameters about that picture you posted? it took my breath away. Honestly, I stared at it for 2 minutes. It’s simply wonderful. Please share camera, lens, f stop, exposure, filter (? ), any postprocessing (?). Thanks a lot in advance. Hey Martin, sorry for the delay, I need to set up auto subscriptions to my posts. Post processing was done in Lightroom. The raw shot was very blue in tone, a result of the Lee Big Stopper. I adjusted white balance, exposure, and did a bit of color touchup to the posts. Very nice image!! is this at the end of 3rd? can you park there any where? Thks for any intell. Plenty of parking on the beach road but bring quarters for the meters. Can’t remember the street names but it’s not far from the main drag shopping street.